The car, which comes as both a coupe and a roadster, can hit 60 miles per hour in as little as 4.2 seconds, and it's been clocked at 155 miles per hour. It uses a 1.5-liter TwinPower Turbo engine in addition to an AC synchronous electric motor. Combined, there is 369 horsepower and 420 pound-feet of torque, and MPGe is estimated at 69. 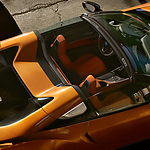 Packed with interior comforts, the BMW i8 is a true example of what luxury looks like in a vehicle. Heated, leather seats are standard, as is a Harman Kardon premium audio system. 11 speakers and a 280-watt amplifier work together to create an impressive listening experience. Ambient lighting throughout the cabin adds to the lovely atmosphere in the cabin.